Comfy, pull-out sleep/sofa featuring mixed hardwood frame with polyurethane foam padding for comfort and to avoid any sharp edges. Gently curved backrest when in the upright sofa position that may be pulled out to a 48" deep sleeping surface. 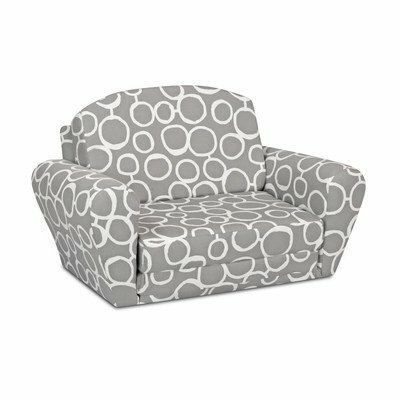 Features gently curved armrests for added appeal and comfort. This dreamer is Upholstered in polyester micro suede in bright pink with multi-colored floral pattern in shades of white, yellow, green and purple, and a matching solid pink polyester micro suede on the top of the surface when in the pulled out position. This offers a nice, soft place to sit or lie on, and may also be easily cleaned with a damp cloth and mild soap. The bottom is covered in black upholstery fabric and there are round plastic knobs on the bottom corners to avoid wear and tear of the fabric. If you have any questions about this product by Kangaroo Trading, contact us by completing and submitting the form below. If you are looking for a specif part number, please include it with your message.